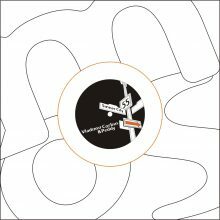 The old stager and Stuttgart-representative of the minimalistic House and Techno scene Vladimir Corbin and his ally Peddy collaborate on Mo’s Ferry number 55. The icing on the cake is the label owner’s appearance as remix producer! “Sinner City (feat. SackJo22)” is a variable and very synthetic Techhouse track with a good deal of Detroit – a big-time rave tune that should be fitting in any setting from intimate clubs to big festivals. No hesitation! “The Grid” comes with a driving, beautiful, rambling stab. An abused TR909 makes this one groove as hell! In conclusion Dapayk gets his hands on “Sinner City” and gives the track his very special personal note, a dash of warm kick-drum and a hand full of “hands up” – you know the deal! Unfortunately not on the vinyl, but as a digital bonus „Jerk Shift“ marks the end of this release.